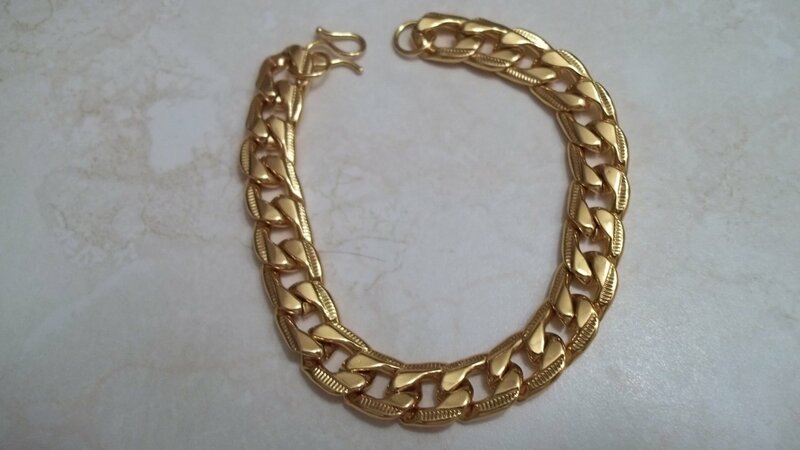 Good quality VERY Masculine 18K Gold clad curb Bracelet. This bracelet has a high shine and polish. Is a very nice fashionable bracelet. Has little ridges going around the bracelet to add some design and substance. Easy to put on and take off. Very versatile bracelet can be worn at the office or the club! Add some BLING to your wrist and attract the ladies! Would make a perfect gift or for yourself! This bracelet is gold clad so it should last for awhile with proper care. Keep Gold clad jewelry away from a lot water and harsh detergents.. When not being worn it should be stored in a plastic bag to prevent it from getting scratched. Item is shipped within three business days of payment approval. Please allow ample shipping time depending on the item destination.Also see our FAQ section for more information on shipping. If you have ANY problems, concerns or questions please contact us for a prompt response. Once the item has arrived we would appreciate Your feedback and rating. Before leaving negative or neutral feedback please contact us.